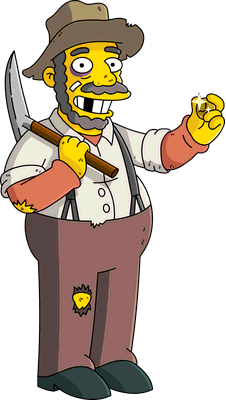 The prospector is an alcoholic cowboy who loves gold. Prospector in the Center for Alcoholic Cowboys. He went to the John Ford Center for Alcoholic Cowboys where he attended a meeting. He said that he was drinking so much that he forgot what life was about; gold. He then started dancing whilst talking excitedly about gold nuggets as big as your fist. Spins and throws pickaxe when tapped. 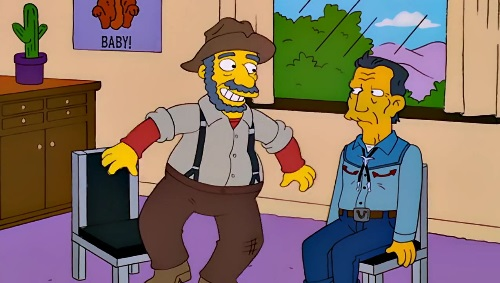 The Prospector's appearance and voice was based on American actor Walter Brennan. 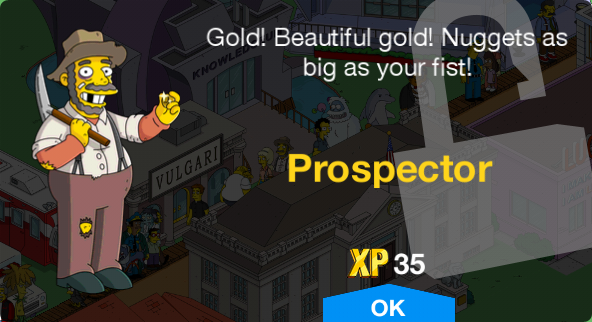 His real name is John, according to the game The Simpsons: Tapped Out. Modified on November 27, 2017, at 19:40.